Designer Byron Foster with specimen displays at Nature Connection World in Killeen Mall. Designer Byron Foster treats specimens at the Nature Connection World workshop in the Killeen Mall. Designer Byron Foster demonstrates the treatment he applies to make everlasting specimen displays. A display designed by Byron Foster showcasing a multitude of butterfly types. David Foster and Christina Campbell showcase jewelry designs at Nature Connection World Temple. Jewelry designer Christina Campbell with a snap bracelet and a pendent made from a butterfly wing. Jewelry designer Christina Campbell at Nature Connection World’s display table at the 38th Killeen Mall Birthday event. Last summer, the Nature Connection World team officially left northeast Kansas for Killeen to share how an intersection between science, preservation and art can be achieved. 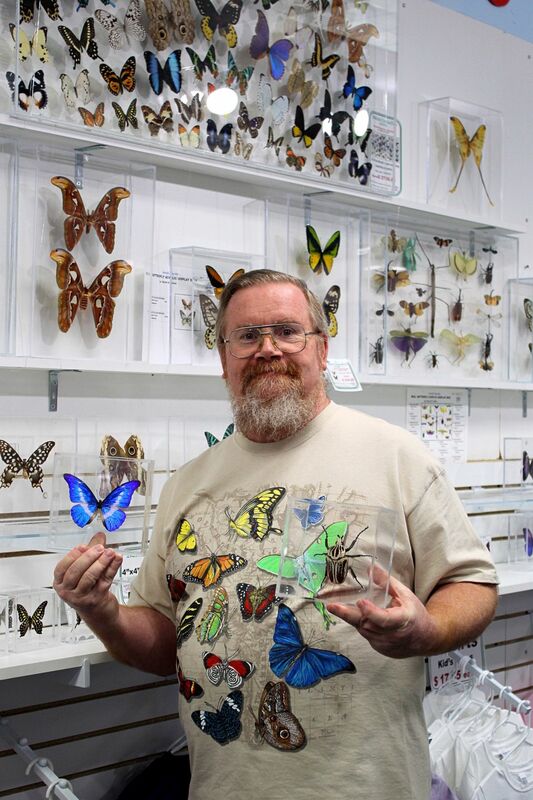 For the last 10 years, Nature Connection World owners and insect specialists David Foster, Byron Foster, and Christina Campbell have been preserving 100% real, farm-raised insects from all over the world to create specimen displays and jewelry pieces for the public. They opened up stores in the Killeen and Temple malls last year. Brothers Byron and David Foster have been collecting and studying insects since they were children. The displays and jewelry pieces capitalize on the vibrant colors found in the insect world and are fixed to appear life-like. No easy task, the intricate preservation process for displays typically takes three weeks and delicate wing pieces are carefully selected and crafted into earrings, necklaces and bracelets. Every specimen or jewelry piece includes an informational card about the insect that was used, as specimens come from unique places and have unique characteristics. “We’re still trying to kinda get set up,” said Campbell who is the team’s lead jewelry designer. “Our move (from Kansas) was a big deal; to move all of us down here and our business. ... So far, we’re liking it. I’ve been so impressed. Everybody down here is so friendly. I have been so impressed with clerks in stores, people on the street. It’s beginning to feel more like home,” Escaping the cold Kansas weather and the locations of their big wholesale customers were also major reasons to settle in Killeen, the owners said. Their work has been sent to customers throughout the U.S., Canada, Costa Rica, Aruba and Suriname and they currently have wholesale customers across Southern states like Arizona, Texas and Louisiana. “We were looking for a place toward the South... (and) pinpointed here ‘cause for awhile I started going around doing kiosks at the different military bases all over the country to sell this stuff. Fort Hood was always a good spot and we actually set up a shop in Fort Hood for a few months and then decided to go ahead and settle up here,” said lead specimen display designer Byron Foster who picked up the craft fulltime after 28 years as a science teacher. “We have butterflies, moths and bugs from six different continents. Basically, everywhere in the world except Antarctica,” said David Foster, regarding where specimens are collected and how they maintain an exceptional variety of specimens. Africa, Southeast Asia, Madagascar, Indonesia and South America are just some places Nature Connection World collects specimens. Nature Connection World opened a store in the Killeen Mall last summer and followed with a Temple Mall store months later, where customers can also obtain cards, mugs, shirts, books, learning materials, toys, kits and decor. The majority of the merchandise is the same between locations but the Killeen Mall’s bigger floor space allows for an onsite workshop and seating area where classes are held. The team is currently experimenting with new designs and ways to display specimens. Custom orders are welcome and teaching engagement requests regarding how insects affect our ecosystem; the unique survival mechanisms insects have developed; creating successful butterfly gardens; talks on general insect species; and more are encouraged.